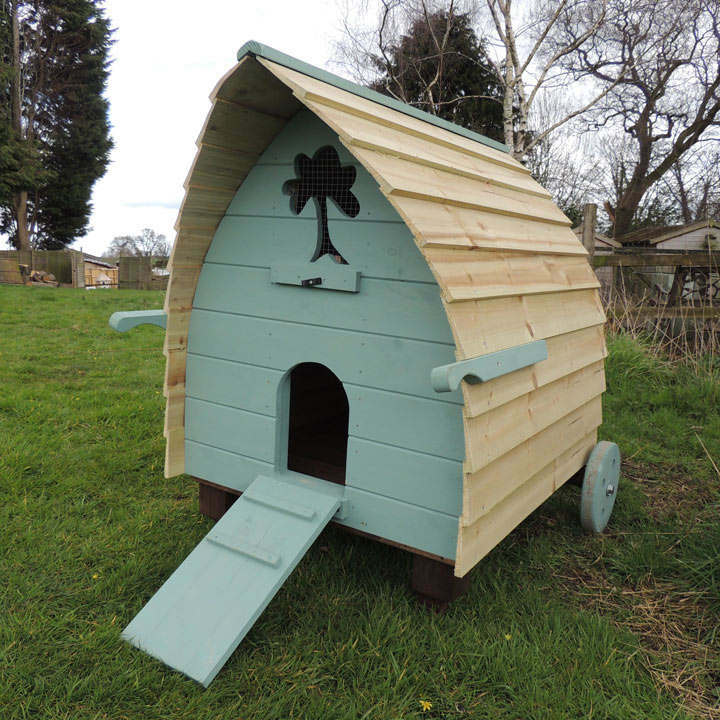 A stylish modern yet practical chicken house constructed from tongue and grooved wooden boards on a softwood frame and clad with softwood tanalised feather edge board for longevity. Suitable for about 8 average sized birds, the whole unit is mounted on two substantial wheels with handles for easy manoeurability. It has an attached access ramp which also acts as a door that can be locked off at night to keep out predators. Mounted on the back of the Chicken Pod are two nest boxes with a hinged drop down door. The complete nest box unit lifts off to give a large access hole into the house for easy cleaning. Painted in Seagrass Green from the Cuprinol Garden Shades Range. FSC® approved. Dimensions: 120cm length x 95cm width x 115 height.